Real life, laughing out loud, jaw-dropping comments, squirming in your seat – this play has it all. How can you make the subject of dementia funny? Well, Bob Larbey (Good Life, Ever Decreasing Circles, Brush Strokes) certainly had a good go, such was his love for local theatre as well as sitcom classics. This was his first stage play, which was first produced in Southampton in 1985. This difficult subject was tackled with gusto, exploring how two residents of a rest home in Surrey manage to cope with their ageing. We are told time after time by medical experts that to keep the mind active is key – and so it is that Cooper (David Cradduck) and Aylott (David Baldwin) play chess and try to remember all eleven members of the Middlesex 1947 cricket team. They can only get to ten though… in the meantime they have also formed an ‘escape committee’ in an effort to get out of the rest home. I really enjoyed their banter together and how they genuinely seem to be great mates. We are also shown awkward visits from Cooper’s younger family members (Claire Smith and Craig Robb) who seem to make any excuse to leave just a few minutes after arriving. There is one particularly spectacular jaw-dropping moment between these two that I really enjoyed on the matter of having dad to stay at home with them instead. We find out that one grandson says he doesn’t want to come at all. How many of us can honestly say that this hasn’t happened in our own family life? The literal meaning of a month of Sundays is ‘a very long period of time’ – and so it was that this performance of the play in Cheriton almost never happened. 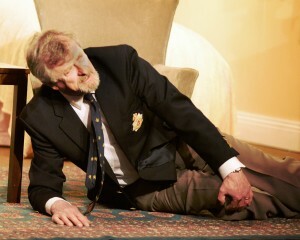 It was supposed to go ahead 18 months ago until serious illness hit members of the cast, particularly David Cradduck (Cooper) who ended up in hospital just ahead of the original staging. We were all thankful for his recovery from what turned out to be a serious illness, and I was particularly moved by his performance. After all, he is on stage for almost the entire play, with one massive amount of words to learn. Twice in his case! 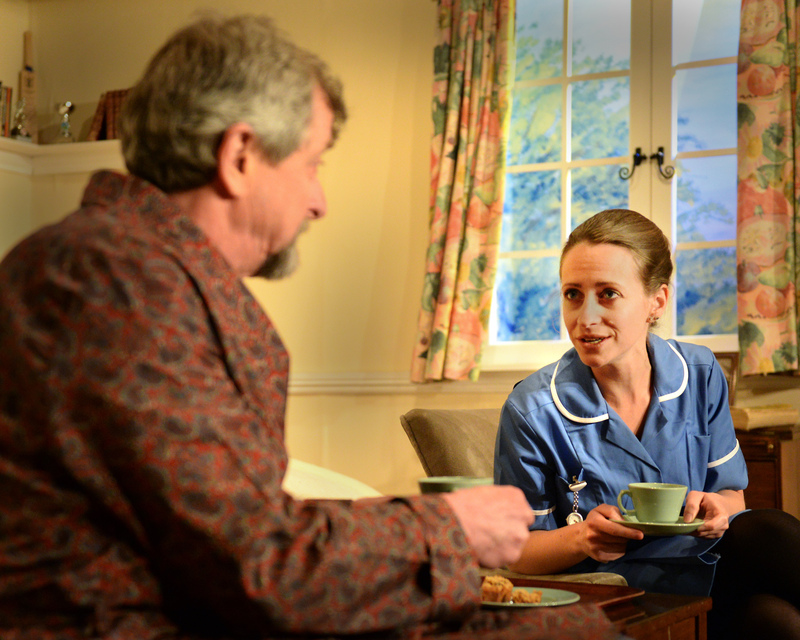 I was also particularly particularly moved by the bond shown on stage between him and his nurse (affectionately known as ‘Wilson’ and played by Alison Carter). It was one of those effortless combinations – when the dialogue is natural, flows well and brings loads of laughs. There is also a smile on my face for the choice of music just as the lights dim and curtains open. I won’t spoil it for anyone who still hasn’t seen it. A thoroughly enjoyable evening in Cheriton made all the waiting for this play worthwhile – it was an excellent decision by the Cheriton Players to go ahead with it after all the previous problems. Even the Chairman (Marilyn Weston) is in this one – it’s only Marilyn’s second appearance on stage with the Players and the response here is “More Please!” Director Reg Large appears to have brought out the best in everyone – congratulations.